Big Bertha vs alien robots! Do you like dice? Do you like to madly press the left (and right) button of your mouse? This game is made for you. Architect Of Terror – released! This is a dark game which deals with racist and inhuman totalitarian dictatorships (no much other infos right now because it’s time for me to go to bed ). In France, the theme was given at 3am. I woke up at 8, and tried to decide what to do. The concept came rather quickly, and as soon as I found it, the implementation, the ideas, and the graphics came fast, without much hesitation, less hesitation actually than for my previous games; I had lots of C++ classes to implement, but I was coding fast, and I was knowing my tools, since I was using a C++ engine I had written myself over these last years (even if I had to do some bugfixes on this engine on the middle of the jam). 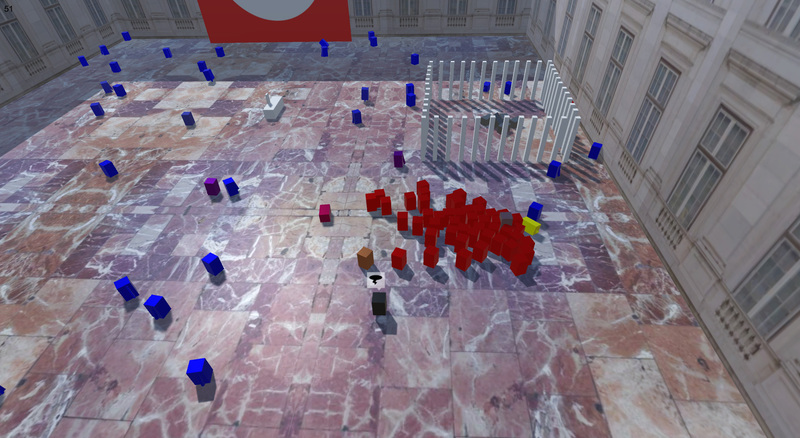 A major part of the game was implemented at the end of day one (There was just no sound/music, nor bonuses, and the cannon could not be hit by fire). My girlfriend and I tested quickly and it seemed fun, and working without known bugs. At the beginning of day two, I woke up early after sleeping less than I usually do, took a coffee without eating first (what I usually don’t do) and immediately started coding. I coded too fast (I think?) the whole day before and I was way way more tense and exhausted that I though. I took a large part of the day off, doing shopping and going to the cinema watching Fast And Furious. I came back on the jam on the end of afternoon, when I felt way more rested. I added some features like sound. I discovered that there was a day three, because I didn’t had understood yet the distinction between jam and compo, silly me. The day three I found a music for the game and implemented a way to fit the game to the size of the screen/window, for any resolution. It was a low level OpenGL and DirectX code that I implemented also as a feature for my personal engine (the Loving Cube Engine), so it took me a large part of the day. … take care of your health! Stress in your friend but also your enemy. Know your limits and take some breaks, even if you love coding like me. I want to work on a new version of the game, but with way more features and complexity. Maybe another theme, but the same idea. Big Bertha vs alien robots! got a bugfix! You might not have experienced it, but there was a small bug which could possibly have done weird things with the game speed when the framerate was lower than 60. You can check out the fixed version (To guarantee that no feature was added, you can even still check out the previous version). Also, I did not do a post for this, but since Thursday a Windows 8 Store version of my game is now available! It’s one of the very rare Ludum Dare games on the Windows Store (The third one ever published, AFAIK). It does not use the same low-level rendering mechanism (DirectX instead of OpenGL), but the high-level code (and thus the game features) are strictly the same. My first Ludum Dare! (for some reasons I hope that I’ll be able to participate all along, but still). 21 queries executed in 0.093 seconds.